This big brown bear looks friendly enough to put your arms around and give him a big hug. But only on this letter identification worksheet. In real life bears are mighty big and might scary. This friendly one want to help you look for all the letter b’s on this page. Look through the frame very carefully and you’ll find 12 b’s, both upper and lower case (3 on each side). You’ll also find three in the sentence, “I like big brown bears.” If your kids have their keen eyes open they might also find the sight word “is” in the top part of the frame. 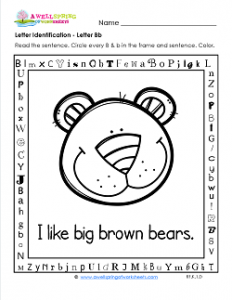 When kids are done finding all the letters they should color the bear what color? Brown, of course!